Adjustment - altering the pipette so that the dispensed volume is within the specifications. Air Displacement Pipettes - are meant for general use with aqueous solutions. In air displacement pipettes, a certain volume of air remains between the piston and the liquid. Aspirate - to draw up the sample. Blow-out - to empty the tip completely. Calibration check - checking the difference between the dispensed volume and the selected volume. Dispense - to deliver the sample. Positive Displacement Pipettes - are used for high viscosity and volatile liquids. 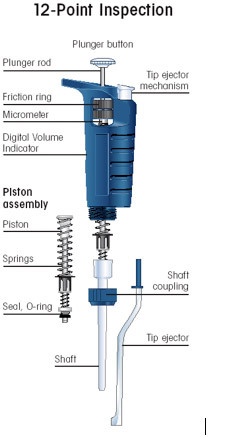 In positive displacement pipettes, the piston is in direct contact with the liquid. Air Displacement Pipette, used for standard pipetting applications, is highly accurate. However, conditions such as temperature, atmospheric pressure as well as the specific gravity and viscosity of the solution may have an effect on the performance of air displacement pipettes. 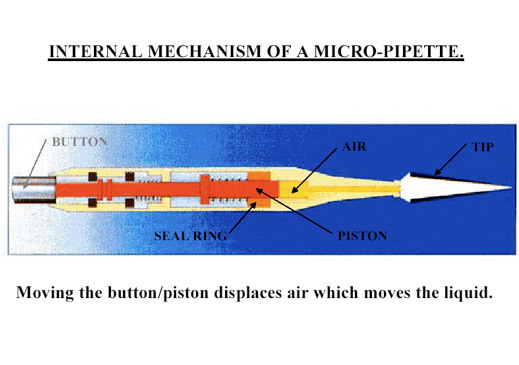 How does an Air Displacement Pipette work? The piston moves to the appropriate position when the volume is set. When the operating button is pressed to the first stop, the piston expels the same volume of air as indicated on the volume setting. After immersing the tip into the liquid, the operating button is released. This creates a partial vacuum and the specified volume of liquid is aspirated into the tip. When the operating button is pressed to the first stop again, the air dispenses the liquid. To empty the tip completely the operating button is pressed to the second stop (blow out). The most important factor in pipetting accuracy is the liquid temperature. 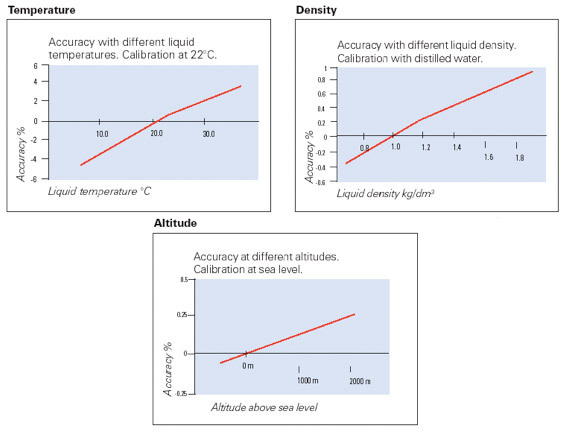 The figure below shows the change in volume when the liquid has a different temperature than the pipette and air. If the temperature of the liquid, pipette and air is the same, the accuracy is not significantly affected. Density is the mass/volume ratio of the liquid. The density varies according to the temperature and air pressure. Typically, the density of water is 0.996 kg/dm3, for ethanol 0.79 kg/dm3 and for sulfuric acid (H2SO4) 1.85 kg/dm3. The geographic altitude affects the accuracy through the air pressure. The air pressure decreases at higher altitudes and the conversion factor Z decreases as well. The boiling point of some liquids can also change to quite close to room temperature, increasing the evaporation loss dramatically. Positive Displacement Pipette, is used for applications like PCR and other DNA amplification techniques. The micro-syringe tips used in positive displacement pipettes are disposable. This helps to avoid sample-to-sample cross-contamination (also known as sample carry-over), and contamination due to the aerosol effect. When the operating button is pressed to the stop, the piston descends to the tip opening. After the tip is immersed into the liquid, the operating button is released. The plunger is then raised and a partial vacuum is created. This causes the liquid to enter the tip. When the operating button is pressed again, the piston descends, expelling the liquid from the tip. Check your pipette at the beginning of your working day for dust and dirt on the outside. If needed, wipe with 70% ethanol. Set the volume within the range specified for the pipette. Hold the pipette so the "grippy finger rest" rests on your index finger. To maximize accuracy, the pipette, tip and liquid should be at the same temperature. Check that you are using tips recommended for this pipette. To ensure accuracy, use only high-quality tips made from contamination-free polypropylene. Tips are designed for single use. They should not be cleaned for reuse as their metrological characteristics will no longer be reliable. *Pre-rinsing (1-3 times) the tip with the liquid to be pipetted may improves accuracy, especially when using positive displacement tips. Avoid turning the pipette on its side when there is liquid in the tip. Liquid might go to the interior of the pipette and contaminate the pipette. Avoid contamination to or from fingers by using the tip ejector and gloves. Store pipettes in an upright position when not in use. Pipette stands are ideal for this purpose. Check calibration regularly, depending on the frequency of use and on the application, but at least once a year. If used daily, a three-month interval is recommended. Follow the instructions for recalibration in the manufacturer�s instruction manual. Press the operating button to the first stop. Dip the tip into the solution to a depth of 1 cm, and slowly release the operating button. Wait 1-2 seconds and withdraw the tip from the liquid, touching it against the edge of the reservoir to remove excess liquid. Dispense the liquid into the receiving vessel by gently pressing the operating button to the first stop and then press the operating button to the second stop. This action will empty the tip. Remove the tip from the vessel, sliding it up the wall of the vessel. Release the operating button to the ready position. Press the operating button to the second stop. Dip the tip into the solution to a depth of 1 cm, and slowly release the operating button. This action will fill the tip with a volume that is larger than the set volume. Wait 1-2 seconds and withdraw the tip from the liquid, touching it against the edge of the reservoir to remove excess liquid. Dispense the liquid into the receiving vessel by pressing the operating button gently and steadily to the first stop. This volume is equal to the set volume. Hold the button in this position. Some liquid will remain in the tip, and this should not be dispensed. The liquid remaining in the tip can be pipetted back into the original solution or disposed together with the tip. This technique is intended for repeated pipetting of the same volume. Can only be used with electronic and repeator pipettes. Dip the tip into the solution to a depth of 1 cm, and slowly release the operating button. Withdraw the tip from the liquid, touching it against the edge of the reservoir to remove excess liquid. Dispense the liquid into the receiving vessel by gently pressing the operating button to the first stop. Hold the button in this position. Some liquid will remain in the tip, and this should not be dispensed. Continue pipetting by repeating steps 2 and 3. Use forward technique steps 1 and 2 to fill the tip with blood (do not pre-rinse the tip). Wipe the tip carefully with a dry clean cloth. Dip the tip into the blood and press the operating button to the first stop. Make sure the tip is sufficiently below the surface. Release the operating button slowly to the ready position. This action will fill the tip with blood. Do not remove the tip from the solution. Press the operating button to the first stop and release slowly. Repeat this process until the interior wall of the tip is clear. Press the operating button to the second stop and completely empty the tip. Remove the tip by sliding it along the wall of the vessel. Viscous solution Protein and nucleic solutions, glycerol, Tween 20/40/60/80 Air Displacement Pos. Displacement Standard wide orifice Pos. Displacement Reverse Pipette slowly to avoid bubble formation. Volatile compounds Methanol, Hexane Air Displacement Pos. Displacement Filter Pos. Displacement Forward Pipette rapidly to avoid evaporation. Carbon filter tips prevent vapors from going into the Pipette. Pos. Displacement Forward For genomic DNA wide orifice should be used to avoid mechanical shearing. 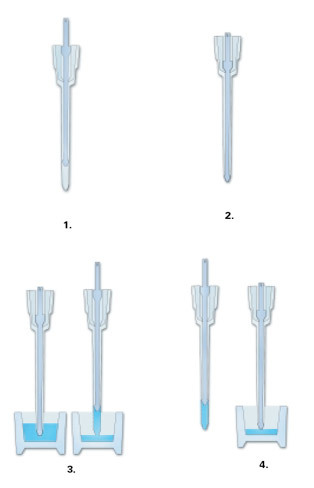 Pipette + tip combination: choose an air displacement pipette and a standard or wide orifice tip. Technique: use the whole blood pipetting technique. Reverse pipetting should be used if high accuracy is needed. Notice: some blood can remain in the tip and on the outer surface. Wipe the tip against the edge of the vessel to remove excess liquid outside the tip before dispensing. Notice: Residual serum can sometimes be found on the outer surface of the tip. Wipe the tip against the edge of the vessel to remove excess liquid outside the tip before dispensing. 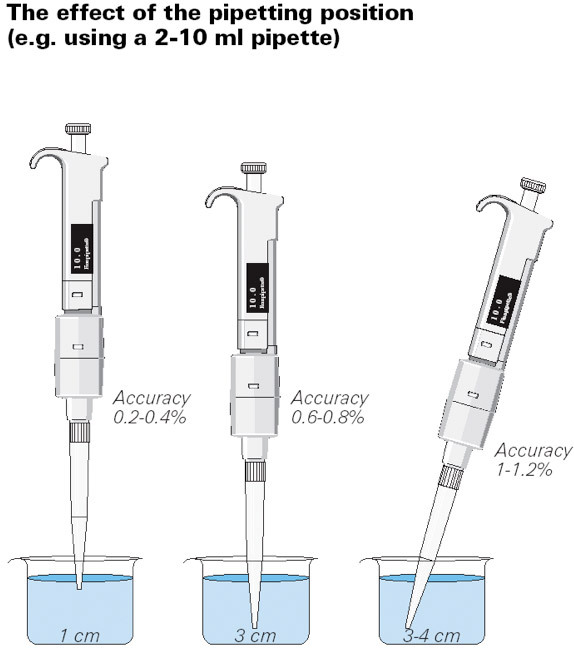 Technique: For high accuracy of performance, use the reverse pipetting technique. Notice: Oily fluids are difficult to pipette because of formation of air bubbles. Filling must be done very slowly to prevent air bubbles. Wipe the tip against the edge of the vessel to remove excess liquid outside the tip before dispensing. The use of a positive displacement pipette and tip is also useful for pipetting glycerol. 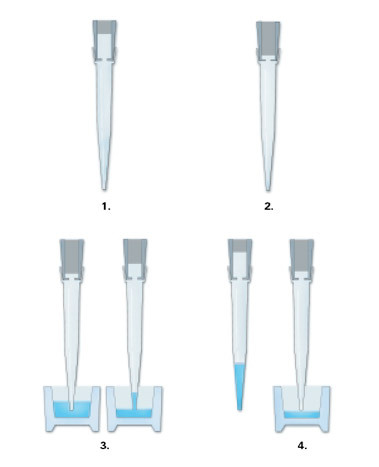 Technique: use the reverse pipetting technique. Notice: Tween has a very high viscosity; to make pipetting easier, it should be diluted to a 10% solution. In any case pipetting will not be accurate; some liquid will stay inside the tip. Aspiration and dispensing should be done slowly. The use of a positive displacement pipette and tip is also advisable for pipetting Tween 20. Notice: Bronidox L is very viscose; the aspiration and dispensing should be done slowly or a positive displacement pipette and tip should be used. Pipette + tip combination: choose an air displacement pipette and a standard tip. Technique: use the forward pipetting technique. Pre-wetting of the tip before aspiration increases accuracy. 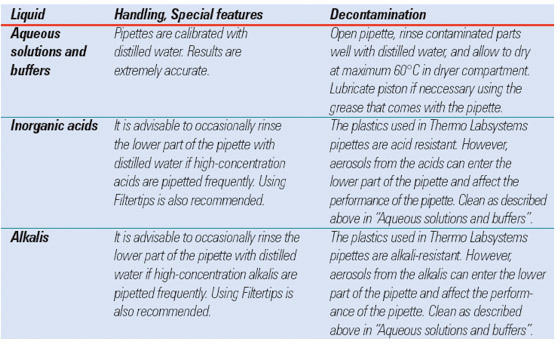 Pipette + tip combination: choose an air displacement pipette and a filter tip. Technique: use the forward pipetting technique. Notice: some acids or bases vaporize easily (e.g. trifluoroacetic acid). Do the pipetting quite rapidly to minimize vapor formation. For genomic DNA wide orifice should be used to avoid mechanical shearing. Pipette + tip combination: choose an air displacement pipette and a filter tip or a positive displacement pipette and tip. Notice: for genomic DNA wide orifice tips can be used to eliminate mechanical shearing. 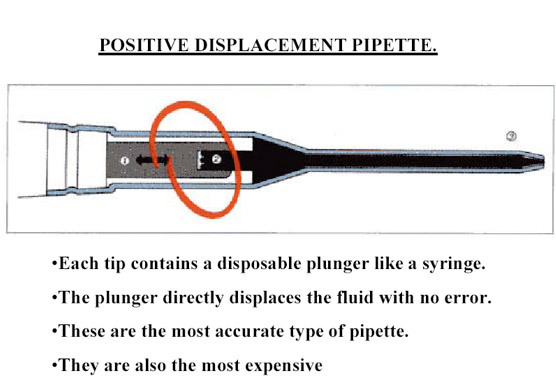 Pipette + tip combination: choose an air displacement pipette and filter tip or positive displacement pipette and tip. Notice: 1.) To get accurate results, calibrate the pipette with the volatile compound you want to pipette. If you use air displacement pipettes, aspirate and dispense the liquid a few times keeping the tip in the liquid. By doing so, the air inside the pipette will be saturated with vapor of the volatile compound. 2.) Pipette rapidly to avoid evaporation when using air displacement pipettes. 3.) It is recommended to use positive displacement pipettes for highly volatile compounds, since the built-in piston tip is in direct contact with the liquid. A contaminated pipette or contaminated tips can cause contamination of samples. Use sterilized tips or sterilized filter tips and if possible autoclave the pipette. Change the tip after pipetting of each sample. Samples or aerosols from samples can enter the cone of the pipette. Keep the pipette vertical when pipetting in order to prevent liquid from running into the pipette body. To avoid aerosol contamination, use filter tips or use a positive displacement pipette and tips. Change the tip after each sample. If you suspect that your pipette is contaminated, autoclave or clean your pipette. One of the most important factors in accurate Pipette measurement is the Tip. The Pipette and the Tip form a System. The best Pipetting results are naturally achieved by those manufactured together to ensure complete compatibility between Pipettors and Pipettor Tip. Many tips on the market look fine, but when studying them more carefully, it appears that the price really reflects quality. Many of the cheap tips may have flashes, protrusions, and scratches, air bubbles, be bent or contain impurities. All these influence Pipetting results. For example, if the tip is not straight this alone may result in a 10% error in Pipetting accuracy (ISO 8655-2). Moreover, if the tip orifice is not accurately centered, the dispensing of the liquid might be affected significantly. If premium grade pure polypropylene is not used or the mold and processing are not up to the highest standards, part of the liquid stays inside the tip as a droplet, which causes an error in the Pipetting result. Made to match the Pipettor in use: It is recommended to use tips specified by the manufacturer as well as high quality Unifit tips. 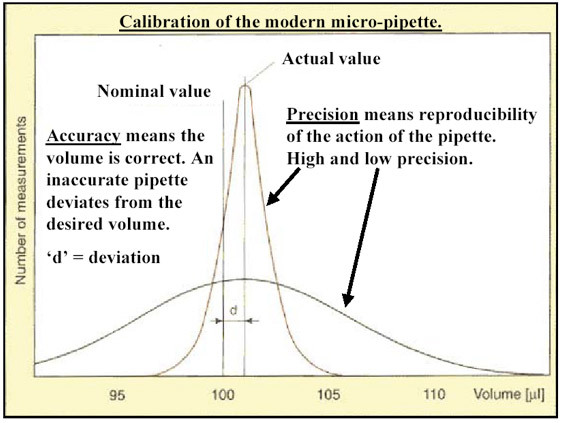 Calibration of Pipettes, officially means determining the difference between the dispensed volume and the selected volume. Adjustment means altering the pipette so that the dispensed volume is within certain specifications. During factory calibration, performance is checked with different weighings at both the maximum volumes of the range and at the minimum or 10% of the maximum volume, whichever is higher. When you purchase a Pipette, you should choose one that is designed to permit recalibration and adjustment for different temperatures and various viscous liquids. The main objective of pipette calibration in a quality system is to ensure that measurements are made with the intended accuracy. Very often error limits are taken from the manufacturer�s specifications, while far less accuracy is required to perform the work. If these limits are not easily obtained, or vary, another option is to set the limits according to accepted standards (DIN 12650 or ISO 8655). However, if the laboratory work requires the highest accuracy, the manufacturer�s limits should be used. Basically every user should define their own limits, according to the application used and the ambient conditions. The scale graduation value of the balance should be chosen according to the selected pipette volume. Note: check the calibration of your balance regularly using known weights. Water, distilled or de-ionized, "Grade 3", conforming to ISO 3696. The test water is held in the calibration room for at least 2 hours before calibration to reach equilibrium with the test room conditions. Tests are performed in a draught-free room at a constant (+/- 0.5C) temperature of 20C to 25C. Relative humidity is recommended to be above 45%. Especially with volumes under 50 vl, the air humidity should be as high as possible to reduce the evaporation loss effect. - The pipette, the water and the air in the test room should be at the same temperature. - A new tip should be pre-wetted 1 to 3 times to improve the accuracy. - Always pipette water from a reservoir, do not take it back from the balance. - Check the calibration regularly, depending on the frequency of use and on the application, but at least once a year. If used daily, a three-month interval is recommended. Upon receipt, each Pipette carefully unpacked and inspected for any signs of visible damage. Any visible damage found is reported back to customer immediately. Customer will be advised if the damage is Repairable and what additional cost will be charged. Customer will issue a new Work Order to cover the cost of Repair. Afterwards each Pipette is scanned for radiation contamination. Any radiation contamination discovered is reported back to customer immediately, and Pipette is Rejected. All customer Pipettes are counted and compared to quantity reported on supplied Work Order. Any quantity discrepancies are reported back to the customer immediately. Customer will have opportunity to locate any missing quantities, or Work Order will need to be revised and revision signed by Customer. Each Work Order will be placed in a separate in-house storage box until scheduled for Calibration. Separate Job ID numbers are assigned for every Work Order. Customer information is checked for any discrepancies from that on file and will be corrected, if needed. If this is a New Customer, a Customer information file will be started. All Pipettes are entered in Cal Lab database under assigned Job ID number with ID number assigned to each instrument. As Found� data obtained and recorded prior to Calibration and any Pipette adjustments are also recorded. Each Pipette will be tested at lowest and highest range points as specified by manufacture. Ten tests performed at each point. As part of Preventive Maintenance, each Pipette disassembled according to manufacturer�s diagrams and cleaned thoroughly with the appropriate chemical solutions. Upon completion each Pipette is reassembled according to the manufacturer�s diagram and procedures. Pipette is again visually checked for proper functionality. At the start of Calibration, each Pipette pre-checked 3 times before any adjustments are done. If Pipette fails, appropriate Calibration adjustments are performed. After corrections, each instrument will be Calibrated at the lowest and highest range points with 10 tests at each test point. Calibration Data will be recorded and reported on a Calibration Report. Calibration reports are issued for each Pipette as well as Calibration Summary for the whole job. Appropriate technicians sign reports. Calibration Label created and attached to each Pipette. All Pipettes crosschecked back to customer supplied paperwork as well as in-lab created documentation. Randomly selected Pipettes are checked for overall performance by QC Supervisor. If any error is detected, the entire Job is sent back for recheck. QC Supervisor approves Job, and Pipette is carefully packaged and delivered to customer with all Calibration Documentation enclosed. The pipette is held in the calibration room for at least 2 hours before calibration to reach equilibrium with the test room conditions. The pipette is checked at the maximum volume (nominal volume) and at the minimum volume or 10% of the maximum volume, whichever is higher. A series of ten pipettings is performed with both volumes. Calculate the accuracy and precision using the Formulas section below. If the calculated results are within the limits given in the Instructions-for-use booklet, the pipette calibration is correct. If not, the pipette has to be adjusted with the lower volume and checked again. Volatile liquids evaporate. Use in saturated air. High density liquids sink. Change technique. Viscous liquids stick to tip. Change technique. Hydrophilic tips will retain liquid. Pre-wet tip. Immersed tips carry over liquid. Immerse 2-3mm. Angled pipettes take up more liquid. Keep vertical. Surface tension reduces accuracy. Change technique. Hot and cold liquids. Pipette liquids at room temp. The human factor. Practice and observe technique. The adjustment is done at the lower volume. Place the service tool that comes with the pipette into the openings of the calibration nut at the top of the handle. Turn the service tool clockwise to increase the volume or counter clockwise to decrease the volume. After the adjustment, check the calibration as described above. 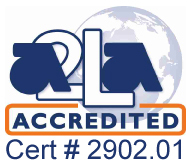 Please follow specific manufacturers� instructions due to substantial variations in calibration procedure. Note: evaporation loss can be significant with low volumes. To determine mass loss, dispense water into the weighing vessel, note the reading and begin timing with a stopwatch. Check how much the reading decreases during the 5 seconds. Compare this to the pipetting time. Typically, the pipetting time might be 5 seconds and the mass loss up to 2 mg. If an evaporation trap or lid on the vessel is used, an evaporation correction is unnecessary. 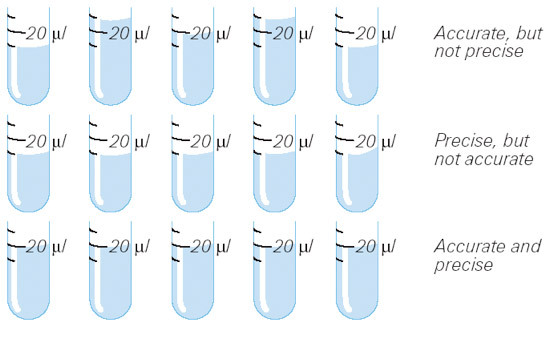 The conversion factor Z is for calculating the density of water suspended in air at the test temperature and pressure. See the conversion Table 1 on page 15. Accuracy is the difference between the dispensed volume and the selected volume of a pipette. Precision refers to the repeatability of the pipettings. 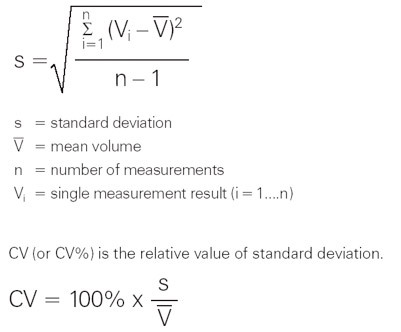 It is expressed as standard deviation (s) or coefficient of variation (cv). In addition to the features of the pipette, laboratory practice and user experience are the main factors affecting precision. The DIN standard does not give individual limits for accuracy and precision, but uses a combined error limit: the F-value. 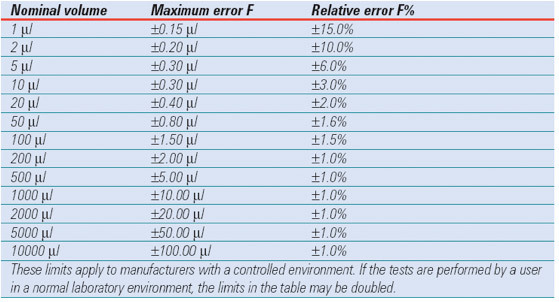 Table 2 shows the error limit according to the DIN 12650 standard for single-channel air displacement pipettes. For multichannel pipettes, these limits are doubled. With variable volume pipettes, the nominal volume is the maximum volume. The absolute vl limit of the nominal volume applies to every selected volume throughout the volume range. For example, for a 20 - 200 vl pipette, the error limit is 2.0 vl for every selected volume. If the nominal volume of the pipette is between those in the table, the relative error limit F% of the nearest volume is used. If the nominal volume is exactly between the two volumes in Table 2, the relative error limit F% of the lower volume is used. Error-free pipetting requires both precision and accuracy. A number of factors can effect these specifications, which are the main quantitative parameters for evaluating pipette performance. What are accuracy and precision? 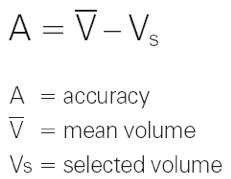 Accurate, but not precise: The mean volume is the correct (set) volume, but separate pipettings differ from the set volume. Precise, but not accurate: There is no variation between the separate pipettings, but the mean volume differs from the set volume. Accurate and precise: The mean volume is the set volume and there is no variation between different pipettings. 1. Pipette vertical, tip immersed about 1 cm into the liquid. 2. Pipette vertical, tip immersed about 3 cm into the liquid. 3. Pipette at a 30 � 40 degree angle; tip immersed about 3-4 cm into the liquid. Please, follow these instructions carefully in order to avoid damage to tips and pipettes. Autoclave tips at 121�C (248'F) for 20 minutes. Immediately after autoclaving, the tips are moist. Allow moisture to evaporate before using the tips, preferably overnight. Some digital model Pipettes can be autoclaved in one piece at 121'C (248'F) for 20 minutes. The tip cone modules of the single-channel models can also be autoclaved. What is the difference between air displacement and positive displacement pipettes? Answer: Both types of pipettes have a piston that moves in a cylinder, or capillary. In air displacement pipettes, a specified volume of air remains between the piston and the liquid. In positive displacement pipettes, the piston is in direct contact with the liquid. This keeps air from entering the tip, preventing contamination effectively. Air displacement pipettes are meant for general use with aqueous solutions. Positive displacement pipettes are used for high viscosity and volatile liquids. How can I pipette viscous liquids? You can do so using an air displacement pipette with standard or wide orifice tip (reverse pipetting, slowly). An alternative to this is to use a positive displacement system. How can I prevent liquid dropping out of the tip when pipetting volatile compounds? If you use air displacement pipettes, aspirate and dispense the liquid a few times keeping the tip in the liquid. By doing so, the air inside the pipette will be saturated with vapor of the volatile compound. It is recommend using positive displacement pipettes for highly volatile compounds, since the built-in piston tip is in direct contact with the liquid. How accurately can I pipette warm or cold liquids. The pipettes are calibrated by weighing distilled or de-ionized water of 20 - 25C. With warm liquids, you will get a smaller mass with a certain volume, with cold liquids, you will get a higher mass.